From the following passage in the trilogy, you might see how hard it is to put these books down–how myth-building to page-turning thrill starts to suspend the reader immediately. 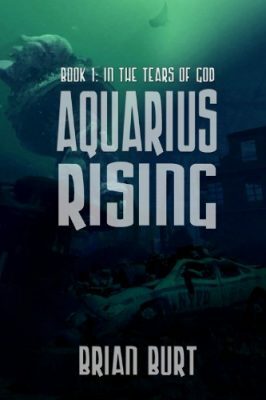 In the series are various human and hybrid species living in a futuristic world where global warming and geo-engineering have greatly altered the planet ecologically and socially. Earth’s land is irrevocably dry and barren, making survival harsh. Seas have risen and slashed the coastal populations with devastation. Scientists create human-dolphin hybrids that can adapt to a climate-changed world. The creation of hybrids, however, also introduces class differences and other battles among different factions–and, unlike in some climate novels where technology has gone by the wayside, this series has developed science such as bio-tech and chemical warfare. I was also impressed with Burt’s imaginative ideas about biosculpting, or what we might call species manipulation. Over and over, throughout the story, we see examples of creatures altered in stunning, horrifying, and amazing ways to serve the needs of the plot. Readers should anticipate a heady combination of action and intrigue based on the events of Book One, in a post-apocalyptic setting that questions heroes, leaders, and a looming war between Mother Earth and Mother Ocean. 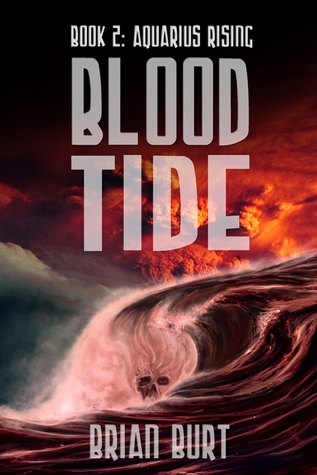 Based in a world that’s survived climate change, the impact of loneliness, life-or-death decision-making processes, and the effects of ongoing conflict illustrate the very different challenges of handling interactions between two worlds almost inhabiting the same body of Earth, making Blood Tide a top recommendation for readers who like ‘climate change’ dystopian stories with more than a dose of philosophical reflection paired with nonstop crisis mode style action. 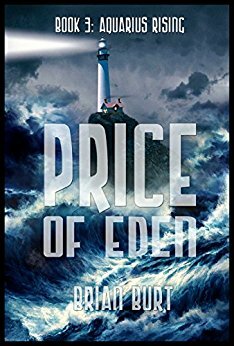 The last novel in my Aquarius Rising trilogy (Price of Eden: http://www.briantburt.com/novels/price-of-eden.html ) ends on an optimistic note, despite the sometimes dark currents that flow through the trilogy in general. I think this is vital, personally. There are so many sources of dismal news, so many depressing scientific developments; I think it’s crucial to look for a light in the darkness, to emphasize that we as a species still have a chance to chart a course to a better future rather than a dystopia. He is not the only author with belief in human survival, despite the ecological catastrophes we have brought on. He also writes psychological suspense and plays with our heart strings when it comes to recognizing both difference and similarities among individuals–and encourages that during disaster if we work together, rather than apart, we might just have a chance.